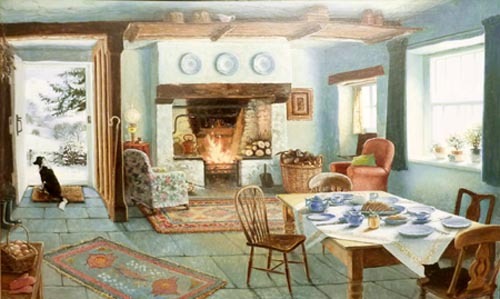 This gallery is devoted to the paintings of Stephen J Darbishire RBA who lives, with his wife and family, in a 17c farmhouse hidden in the mountains of the English Lake District. The love of his surroundings comes to life through his paintings. The interiors of cottages and farm houses, sunlight pouring in through windows, fires burning in open hearths, tables laid for afternoon tea, (Kerry, his wife, loves to cook), vases of flowers from the hedgerows and gardens; the celebration of the seasons. Sometimes he also paints love stories. If you are romantic at heart and like all of these things, WELCOME. I now produce prints of most of the paintings illustrated in the galleries and all greetings cards. I have 2 print sizes. Approximately 8 X 11 inches picture size on A3 (11.5 X 16.5 inches) fine art paper at £65.00 and 11 X 17 inches picture size on A2 ( 16.5 X 23 inches) fine art paper, at £95.00. The prints are unframed and the price includes postage and packing in the United Kingdom. and Northern Ireland. These prints are open, signed prints, produced to order. Limited Edition prints please look at the art gallery devoted to them.